An overall drop in the market is exacerbating JPMorgan's losses tied to its bets on corporate bonds. NEW YORK (CNNMoney) -- One thing seems clear about JPMorgan Chase's $2 billion loss. It's no longer $2 billion. It's likely much higher. The number being bandied about now is closer to a range of $6 billion to $7 billion, according to several people working on trading desks that specialize in the derivatives JPMorgan Chase (JPM, Fortune 500) used to make its trades and from two sources with knowledge of the bank's positions. But experts said there are few scenarios in which hedge funds on the other side of the bank's giant bet will let JPMorgan Chase out of it without significantly more pain. "The market knows roughly what [JPMorgan] has and what the sizes are," said a source with knowledge of the bank's positions. Why have the losses grown since chief executive officer Jamie Dimon informed the public of them? The market's overall slide hasn't helped. Since last Thursday, the U.S. and European stock markets have dropped significantly. The S&P 500 (SPX) is down roughly 3.5%, and the main European indexes are down between 4% and 6%. JPMorgan Chase's trades were built around contracts tied to corporate bonds. Specifically, JPMorgan Chase sold huge amounts of protection on an index of 125 highly rated corporate bonds. Simply put, JPMorgan Chase's massive trade stood a better chance to pay off if the market had continued to rally. Now as the overall market has worsened, it costs even more for JPMorgan Chase to sell protection against possible bankruptcies on corporate bonds. Since JPMorgan Chase is basically the only one on its side of the bet, a worsening market makes it even more expensive to keep this position and more difficult to find other places to offset these losses. JPMorgan Chase's main bet has been on an index, known as IG9, of 125 U.S. investment grade companies. Shares of three of the 125 companies -- retailer J.C. Penney (JCP, Fortune 500) and insurers MBIA (MBI) and Radian (RDN) -- have taken big hits since last week, driving up the cost of offering protection against a default. Additionally, since Dimon's announcement, more hedge funds have piled into the index, further driving up the cost of selling protection. It's clear from public data filed with The Depository Trust & Clearing Corporation that JPMorgan Chase hasn't sold any of its positions yet. The DTCC tracks trading activity and sizes of positions on the IG9 and other indexes, and there haven't been any big moves since last week. "Whatever the size was, it's clearly not something that you can call one or two dealers and sell," said Garth Friesen, a co-chief investment officer at AVM, a derivatives hedge fund that's not involved in these trades. As soon as it becomes clear that JPMorgan Chase is unwinding its position, it will be obvious to players on every major trading desk. Hedge funds will immediately start piling into that index and buying protection, driving up the bank's losses. Until then, it won't cost the hedge funds much to sit and wait. "There will be a stare-fest between the hedge funds and JPMorgan," said James Rickards, former general counsel at Long-Term Capital Management, a hedge fund that required a $3.6 billion bailout from the Federal Reserve because of its massive losses from its trading activities. "It will cost JPMorgan an unimaginable fortune to push the spread back in their direction," he added. But JPMorgan Chase may blink first. It could face pressure from U.S. government regulators to start selling some of its positions. Both the Securities and Exchange Commission and the Federal Bureau of Investigation are looking into JPMorgan's trade. Dimon has also been called to testify before the Senate Banking Committee. The bank's shareholders may grow increasingly anxious as well, which could force JPMorgan Chase's hand. Shares are down 18% nearly since the company announced the loss. "It's not just a battle between Dimon and the hedge funds," said Rickards. "It's been JPMorgan and the regulators, the FBI, Congressional committees and stock holders. 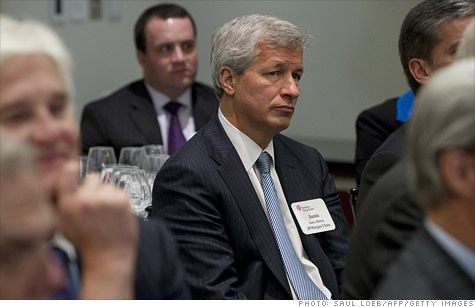 It's not clear that their tolerance for pain will be as high as Jamie Dimon." For now, the one thing working in JPMorgan Chase's favor is the market's bet that the bank is too big too fail, making it dangerous to push too hard on the other side of its trade. But the dangers are far greater for JPMorgan Chase.